Square Enix has slashed the price of its turn based stealth cyberpunk puzzle-adventure, Deus Ex GO, to a whopping 80% off of its launch price. The game had only been launched about 3 months ago, for about Rs. 300 ($4.99). Deus Ex GO sees Adam Jensen, from Deus Ex: Human Revolution, uncover a conspiracy plot. The game featres a variety of enemies like guards, drones, turrets, etc, and to get past them you will need to use some special skills like hacking, augmentations, and of course good-old combat. 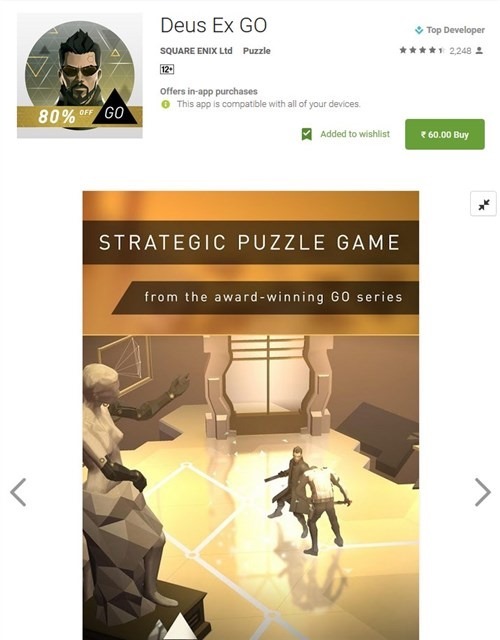 The specialty of Deus Ex Go, is that it has new puzzles released on every weekday, in the form of Live Content, and you can access the puzzle swhich were released before as well. So in addition to the 50 levels, you are getting a ton of new puzzles to play. Buy Deus Ex GO for Rs. 60 from the Google Play Store in India, ($0.99 in other regions). The game has optional In App Purchases for hints. While you are at it, you can also get the other two games in the GO series, Lara Croft GO and Hitman GO for Rs. 60 each, and Hitman Sniper for just Rs. 10.